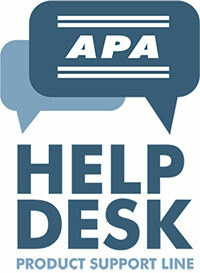 The APA Product Support Help Desk, a free service, is available to answer your questions pertaining to the specification and application of engineered wood products and systems. Staffed by specialists who have the knowledge to address a diverse range of inquires related to engineered wood, the Help Desk receives hundreds of e-mails, faxes, and phone calls each week from a wide variety of users and specifiers of engineered wood products. Call (253) 620-7400 weekdays 7AM to 4PM Pacific Time, or leave a message anytime. When leaving a voice message, provide brief details regarding the nature of your inquiry and type of product(s). This will assist our specialist as they prepare your answer. It is often helpful to also provide your email address. Alternatively, submit your question via the contact form. Do APA specification/use recommendations apply to products certified by other agencies? No. Since the APA trademark appears only on products manufactured by member mills of APA – The Engineered Wood Association, it signifies that the products are subject to the Association’s audit — the toughest and most comprehensive quality auditing program in the industry. The technical information and product use recommendations developed by APA are based on research and testing of APA trademarked products and therefore does not apply to panels certified by other agencies. Marine-grade plywood is a specially designed panel made entirely of Douglas-fir or Western Larch. The grade of all plies of veneer is B or better, which means it may have knots, but no knotholes. The panels are sanded on both faces, and are also available with Medium Density Overlay (MDO) or High Density Overlay (HDO) faces. The maximum core-gap size permitted is 1/8 inch. Its exposure durability rating is EXTERIOR and the glue used is a fully waterproof structural adhesive. It is considered a “premium” panel grade for use in situations where these characteristics are required, i.e., for boat hulls and other marine applications where bending is involved. Marine-grade plywood is available in 4x8-foot sheets of 1/4, 3/8, 1/2, 5/8 and 3/4-inch thickness. Sheets up to 5x12 feet are also available. Available grades are A-A, A-B, B-B (face-back), MDO and HDO. Marine-grade plywood is not treated with any chemicals to enhance its resistance to decay. If decay is a concern, it should be pressure-preservative treated to an appropriate standard. The detailed description of veneer grades and Marine-grade plywood is contained in Voluntary Product Standard PS 1-09: Structural Plywood. What are mold and mildew, and can they compromise the integrity of engineered wood? Mold and mildew are microscopic fungi, a low form of plant life that lives off of organic matter rather than a photosynthetic process. Mold and mildew appear as woolly or powdery growth on numerous substrates. Mold spores are always present in outdoor and indoor air, and almost all building surfaces can provide nutrients to support growth. The incidence and development of mold and mildew depend heavily on temperature and moisture conditions. A warm, wet or humid environment provides ideal conditions for the development of mold and mildew on a variety of surfaces, including wood structural panels. Mold and mildew are terms commonly used interchangeably, although mold is often applied to black, blue, green, and red fungal growths, and mildew to whitish growths. The color depends on the infecting organism and the type and moisture condition of the nutrient. For example, white mold is commonly found on water-saturated laboratory test samples of wood stored at room temperatures overnight. Mold and mildew are not decay-producing fungi, although decay may occur under similar conditions as mold and mildew (high moisture, 30% ± moisture content). By itself, the water vapor in humid air usually will not wet wood sufficiently to support significant decay, but it will permit development of some mold and mildew fungi. Thus, wood will not decay if it is kept air dry. Allowing the wood to dry to a moisture content not exceeding 20% stops further growth of mold or mildew fungi. The surface growth often can be easily brushed or surfaced off. Additionally, a chemical spray solution of 10% household bleach and water will kill the fungi. However, under renewed moist conditions, new infestation may occur. For additional information refer to APA’s Mold and Mildew publication and moisture mitigation webpage, which includes a ten-point mold protection plan. In the applications for which they are manufactured, the two products are virtually interchangeable. Although different in composition and appearance, plywood and OSB are manufactured according to the same performance standard criteria. Does structural panel siding have shear values? Yes. Plywood APA Rated Siding is often used for shear wall sheathing. The thickness of the panel at the point of nailing on the panel edges governs shear values. Other APA Rated Siding panel types may also qualify for shear values on a proprietary basis. To check for specific shear values, refer to the APA Engineered Wood Construction Guide. What panel grade should be used when the architect specifies underlayment? Several panel grades and layups are suitable for use as underlayment, however, the appropriate choice depends upon the type of finish flooring. For example, only fully sanded veneer-faced underlayment panels meet APA recommendations for application under resilient floor coverings such as tile or sheet flooring or fully adhered carpet. Other underlayment grades meet APA recommendations for less demanding floor covering applications such as carpet and pad and ceramic tile. To be assured that the right underlayment is used, refer to the APA Underlayment Guide for Resilient Floor Covering. It is important to understand that the term Structural I refers to certain specialized strength and stiffness characteristics of wood structural panels while the term Exposure 1 refers to the glue bond durability of a wood structural panel. Note: APA Rated Plywood Sheathing Exposure 1, commonly called “CDX” in the trade, is sometimes mistaken as an Exterior panel and erroneously used in applications for which it does not possess the required resistance to weather. “CDX” should only be used for applications as outlined under Exposure 1 above. For sheathing grade panels that will be exposed long-term to weather, specify APA Rated Sheathing Exterior (C-C Exterior plywood under PS 1). How do I specify APA products? These downloadable spec sheets outline and explain the information included in the APA trademark and include a sample specification for submittal. RTD is not a separate or special grade of sheathing. RTD is an abbreviation for "Rated,” and the terms "RTD SHG" and "RTD Sheathing" are shorthand terms for Rated Sheathing. Rated Sheathing can be either OSB or plywood and the term can apply to both PS 1 and PS 2. I have x# live load and an x# dead load on my roof/floor; what panel should I specify? The fastest way to determine live and dead load capacities is to check the APA load span tables for roof and floor applications in the APA Residential and Commercial Design Guide. The tables provide allowable live loads for panels installed over common support spacing configurations. What is the requirement for edge clips on roof sheathing (panel edge support requirements)? What are the APA recommendations for panel spacing? Why is spacing important? APA recommends 1/8-inch spacing at all panel end and edge joints unless otherwise indicated by the manufacturer. Spacing is important because wood expands and contracts in response to moisture content. By spacing panel edges and ends during installation, the risk of panel buckling is minimized. APA’s 1/8-inch spacing recommendations are based on typical 4’ x 8’ panels installed under and for normal conditions. If larger panels are used or if severe moisture conditions are anticipated, increased spacing may be required. How do I earn CEUs through APA? Many of the webinars, seminars, and other educational opportunities presented by APA offer participants continuing education units. If the course offers credit, the type and number of units available are listed in the course description. For current opportunities, visit the webinars page. APA issues participants a "Certificate of Completion" to document credits earned at the time that the course is completed. The participant subsequently provides this certificate to the association from which they seek credit. The association will grant credit, at their discretion, for educational experiences that they deem qualified. Representatives available from Monday to Friday, 7:00 AM to 4:00 PM, PST. Please make sure to provide brief details regarding the nature of your inquiry and type of product(s).